Les: Welcome to the first roundtable discussion of 2013 at This Was Television! Following the success of our spooky show and detective show roundtables, we’ve decided to go with another thematic focus, looking at a sampling of shows in the same genre. And for our next series, we’re going with one of the most historically popular genres of television: science fiction, more specifically shows centered around space travel. With virtually nothing about the universe beyond our planet known for certain, deep space has been a fertile storytelling bed on television for almost the entire life of the medium, with countless writers and shows finding their own interpretations of both alien worlds and the humans who explore them. Television shows set in space have been some of the most critically acclaimed programs in history (and also some of its most disastrous failures), and inspired fanbases that remain devoted to their favorite show years if not decades after they aired. We’re hoping to to chart the course space-centric sci-fi has taken over the years, and the balances struck between its escapist tendencies and real-world metaphors. 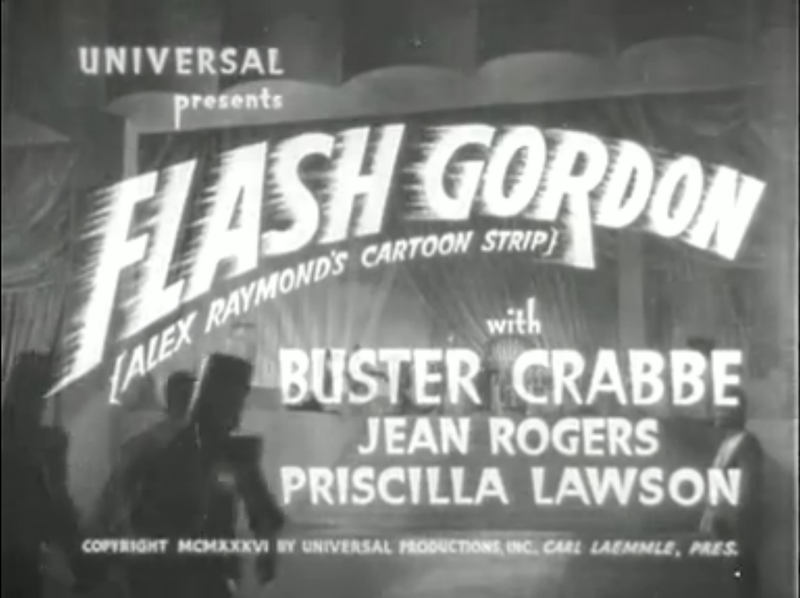 For our first show, we’ll be looking at what is not only one of the earliest installments of the genre, but also the oldest program that we’ve ever discussed here at This Was Television, the 1936 Flash Gordon serial. Now, while not technically a television series, Flash Gordon is in many ways a precursor to the episodic nature of TV storytelling, a program where you have to come back on a weekly basis to see what happens next. 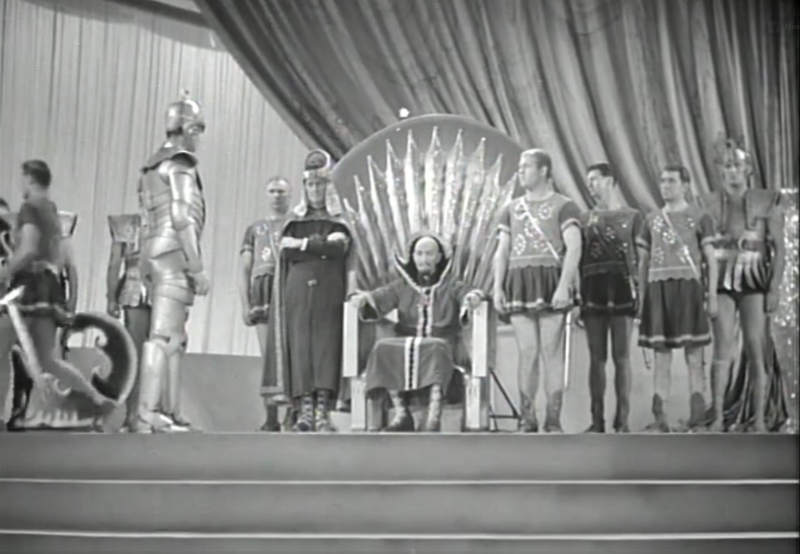 There are also plenty of structural similarities to shows that have come since: Flash Gordon is very much a prototypical hero for the genre, he has an ensemble cast in Dale Arden and Dr. Zarkov, and his story even has a Big Bad in Ming the Merciless. It seemed like an interesting start for the project; and more to the point, it seems like a fun exercise to look back at the absolute earliest example of programming and see how it holds up in a modern light. Is it a hidden gem of history, where the lack of special effects mean storytelling takes over; or will it be an anachronistic entry better suited to an episode of Mystery Science Theater 3000? Sadly, the latter is the case, because while I’m sure it was impressive at the time (when I believe the style was to wear an onion on one’s belt) Flash Gordon has aged spectacularly badly. 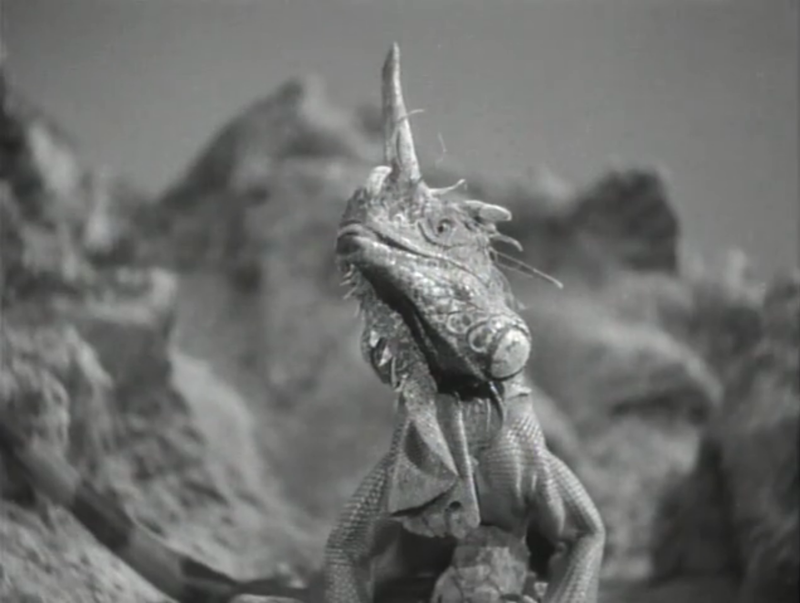 I know that at this point in history special effects were in their infancy, but any excuses I tried to make were lost in the goofiness of the great space beasts of Ming’s world represented by a terrarium of iguanas. 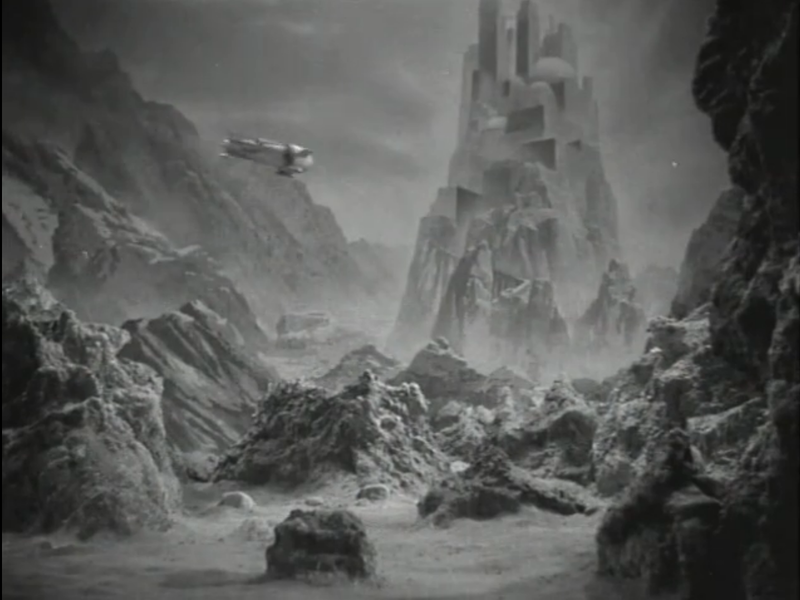 It’s riddled with a lot of the things that plagued the bad sci-fi films of the era: footage and sets clearly recycled from other films, performances that define wooden, and stock footage galore (leading to one jaw-droppingly racist moment where the reactions of the world at large to Ming’s planet are presented in less than politically correct terms). And the silliness of the plot in certain points is hard to take: Oh, of course Flash and Dale parachute down exactly where Dr. Zarkov’s ship is! And yes, of course Ming’s daughter falls in love with Flash at first glance! That being said, I was able to find a little bit of non-ironic appreciation in the installments. I wouldn’t say Buster Crabbe is a good actor, but he’s not dead weight either, someone who has both the stoic nature and devil-may-care attitude that you’d expect a hero to adopt. And I like the fact that he’s presented as something of a normal guy in extraordinary circumstances (playing polo appears to be the source of his powers evidently), and as such he’s mostly dealing with those circumstances as they come to him. It’s a first step in the space-faring protagonist who I’m sure will dominate many of the installments in this roundtable, a square-jawed hero who’ll brave any alien dangers to save the girl. But for the most part, there was a lot of laughing at the fact that Ming’s soldiers either dress up like the Tin Woodsman or have a pathological aversion to wearing pants, or the beyond cheesy effects of the monster in the end of second installment. (Which, since this is the one we ended on, I suppose means we can just assume means Flash died in his claws and the serial concluded on a wholly depressing note.) It wasn’t bad, but boy it was silly. So, did anyone else enjoy the show, or like me was it chiefly in an ironic sense? Anthony: I watched this entire serial on Netflix last year, one installment every Saturday for thirteen weeks in a row. Rewatching the first two chapters now, I’m still of two minds about it. As a 28-year-old man in 2012, I can see many negatives: it’s very padded, the plot goes in circles, most of the acting is stiff, the villain is played by a man named Charles B. Middleton in yellow face, all women exist only to fall in love with Flash, and it looks like it was made for twelve dollars. But none of that matters at all, because it’s absolutely thrilling! Watching these episodes, I can imagine myself as a ten-year-old in 1936, waiting for each new chapter on the edge of my seat. There’s a planet hurtling towards Earth! With giant lizard monsters! 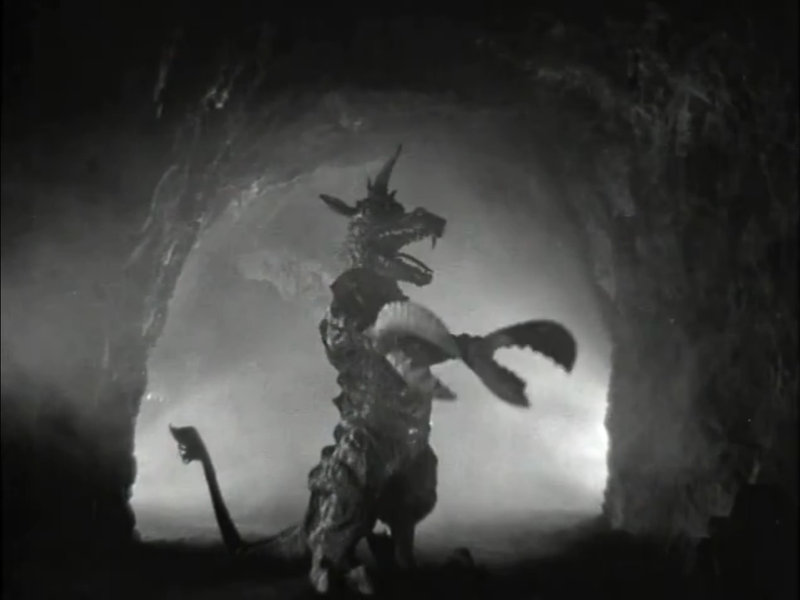 And look, next week – “CAPTURED BY SHARK MEN!” Could Flash–nay, could life–possibly be any better? A lot of the credit for that goes to Buster Crabbe’s work as the title character. He’s not the world’s greatest actor, but his square-jawed, straight-forward charm makes up for it. More importantly, his rich, commanding voice really sells the excitement of all the silliness going on around him. As much as the action, Crabbe himself makes me want to follow Flash’s adventures from one cliffhanger to the next. Of course, the cliffhanger resolutions are never quite as earth-shattering as they are in my head. The aforementioned shark men–so gruesome in name, and so skilled at capturing Earthmen–turn out to just be a bunch of guys with aluminum foil on their heads. But the disappointment is always temporary, and I’ll soon be sucked back in by a fight scene (such as the well-staged arena fight in the first chapter) and the promise of Lion Men to come. Finally, I watched these two episodes on my iPad. If I wanted to, I could watch all thirteen in a row while walking around town. The 1936-era little kid in me would be amazed. Frankly, so would Dr. Zarkov. I wanted to say I disliked these chapters of Flash Gordon, but that feels mean-spirited. It’s certainly bad, and cheap, and borderline incompetent in places. But so were most of the Saturday morning cartoons I watched as a kid, and this feels very much of the same cloth. These serials are clearly made only for the little ones, and it’s odd to think that the sci-fi series that would come in the following decades would often get pigeonholed for the same demographic. Cameron: Hindsight is 20/20. The definition of science fiction that I tend to use is “the extrapolation of a possible future from scientific innovation.” The spaceship may be able to pass through the stratosphere (oh, 1930s scientific understanding) but its design and purpose is not far off from that of, say, a stereotypical spaceship of today. And that’s the simple beauty of a film serial like this: it’s an untested haven for trying out new science-y ideas while simultaneously appeasing the wide American audience. More importantly, Flash Gordon is defining the narrative of the impending war. Well ahead of the news serials that dominated the ’40s, “The Planet of Peril” begins with a series of brief clips showing a world in turmoil: conflict in the Middle East; class tensions in London; trains being late in Rome. In order to escape a storm, Flash and Dale parachute out of a plane, echoing military paratroopers who will soon take prominence. 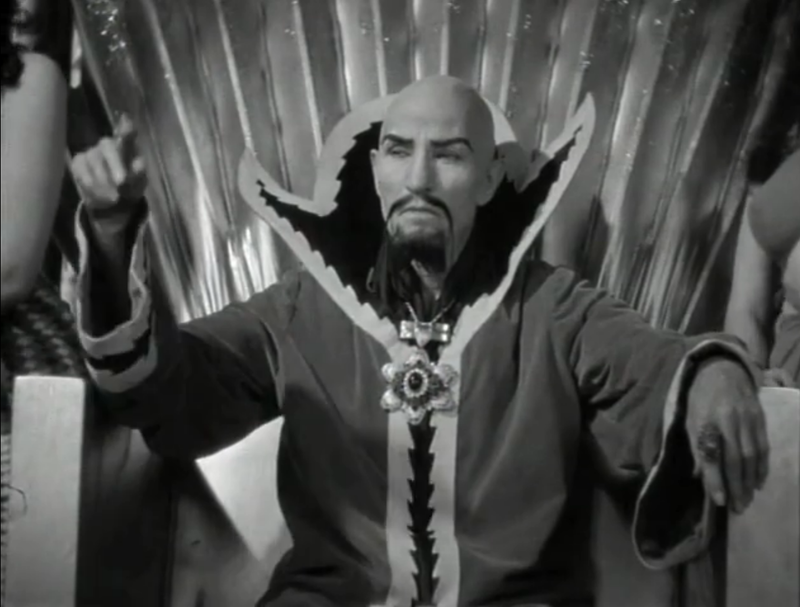 And if Emperor Ming isn’t the most racist caricature of Mao Zedong I’ve ever seen committed to film, I’ll eat my hat and Les’s hat. (Editor’s note: Go ahead. I have several. -LC) Most importantly (and somewhat bizarrely, given that he’s described as blonde-haired and therefore probably also blue-eyed), Flash himself just never stops fighting. Iguanas? Pump the testosterone and save the girl! Robots? They’re trying to kill us when we thought they were saving us—BETRAYERS! Ape-like man killers (Hulu’s definition, not mine)? CRUSH THEM! America won’t enter World War II until it’s well underway, but they already have a Captain America in Flash Gordon, and they’ve already weighted the war in their favor. Witness the birth of American exceptionalism. That’s all in hindsight, of course. But I also don’t think it’s an accident that Flash Gordon predates interplanetary travel by a few decades. It’s just one of several ideas presented in the serials that is a few steps too far ahead of its time, as American ingenuity and resources will go to the war in the ’40s and the rebuilding of society in the ’50s (not to mention the start of an endless round of military spending beginning with the Korean War). If we can create planes that can travel across vast intraplanetary distances, why not look up and shoot those things into the endless night sky? Humans will do just that, and with them comes that most human of impulses: the telling of stories. Not all of them are thrilling (trust someone who’s actually watched the original Battlestar Galactica) but they are all born by the human mind, searching for the spaces yet to be explored. The cavernous “Planet of Peril” with its terrifying “Tunnel of Terror” is just the beginning. I don’t know why you didn’t just review the ’50s FLASH GORDON TV series, though it’s not nearly as good as the serial. The 1936 serial is one of the shining examples of the genre, even though it was made by Universal and not Republic, the studio that did serials way better than everyone else. Yeah, I guess you can nitpick performances and special effects if you want, but if you look at FLASH GORDON in the context of its time, it’s pretty damn fun (and just in terms of fun, it’s a helluva lot more fun than, say, JOHN CARTER or THE DARK KNIGHT RISES or basically every other “superhero” movie of today). It’s mostly due to Crabbe, who was the perfect serial star–handsome, athletic, confident, and, yeah, a strong voice to reinforce his heroic nature. Middleton, one of the great serial villains (you should really see the amazing DAREDEVILS OF THE RED CIRCLE), is a wonderful Ming (something Max von Sydow was obviously aware of), and the art direction and visual effects are breathtakingly imaginative, regardless of the budget. I’m curious–and I’m doubtlessly not alone–about how you choose the particular episodes for your roundtable. Why, say, “Arena,” as opposed to any of the other 78 STAR TREKs? And it’s an important aspect to think about, the relation between film and television (and not to mention radio and literature). So, in a lot of ways, the selection of the film serial helps to show the intermingling of media and genre conventions. Nothing’s created in a vacuum, and this is a way of acknowledging that, especially given the roundtable’s theme. The episode selection issue I cannot speak to since I was not involved in that process. Following up on Noel’s comment, I also selected the serial because it’s more readily available than the 1950s series, on both Hulu and Netflix. Whenever possible, we like to select shows where readers can watch along if they want to, hence why we provide availability when announcing the schedule. As to the selection of episodes, truth be told it’s not an exact science. Sometimes we select episodes that are considered a representative part of the series, sometimes we select them because a particular member of the roundtable is more familiar with the series and thinks they’ll be a good topic of discussion (as when Cameron proposed “Grotesque” last month), and sometimes we select them because the title or description just look like fun. (As you can see, the Buck Rogers selection is “Space Vampire,” because there’s no way we’re not watching an episode of television called “Space Vampire.”) In general though, we try to steer away from more mythology-heavy episodes of the shows, since we’re only watching one at a time. Since you mentioned it specifically, I chose “Arena” because it’s both a very iconic episode of the series (Kirk dueling the Gorn is one of the show’s most referenced moments) and it’s based on a similarly iconic short story. Sad to say, “Space Vampire” actually *is* representative of BUCK ROGERS, though the early two-parters that aired right after the pilot are better episodes and more enjoyable watching. “Arena,” while not among TREK’s best or worst episodes, is a very good one, and I would agree it’s basically representative of the series, albeit more action-oriented.